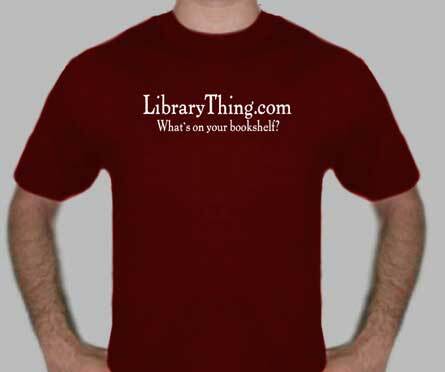 Give the gift of LibraryThing: Teeshirt sale and more! Don’t know what gift to give your favorite bibliophile? Support reading habits, show readers in your life how much you care about their happiness, and give the gift of organization with the LibraryThing store. We have LibraryThing teeshirts, on SALE! Normally, they’re $15, but we’re selling them for $9 until December 31st. We also have cuecat barcode scanners ($15), stickers ($2) and gift accounts (yearly:$10, lifetime: $25)*. Who wouldn’t like to receive a package with a cuecat cozily wrapped in a teeshirt? 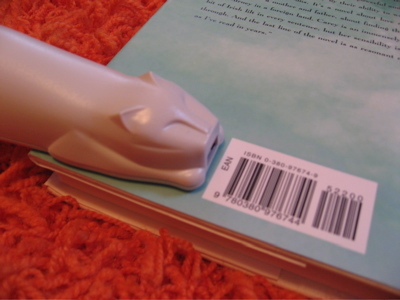 Another great pairing is a gift membership and a cuecat, for the post-holiday cataloging frenzy. We accept PayPal, credit cards, and even checks or money orders. *Shipping is not included in the prices I quoted, but if you click on the links, you can figure out how much shipping costs based on your location and desired expediency. I'd really like a cool LT shirt, but the current shirts look rather boring. Why don't you do a shirt-design competition to get some more interesting variants? actually, I would have bought the chef's apron! I agree with NancyO. I looked for an apron to buy one, but, alas, no aprons. I also think a competition would be good. Maybe a set of cardstock bookmarks with the best designs could be a result? What a great idea! I have thought several times about buying the shirts, but they are rather boring. I would also definitely purchase cardstock bookmarks of top designs. Who can't use more bookmarks?! I'm dreaming of a long-sleeved option….